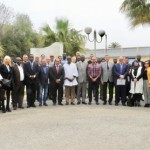 The African Centre for the Study and Research on Terrorism (ACSRT) and the Committee of Intelligence and Security Services of Africa (CISSA) jointly organized the 6th Meeting of the ACSRT Focal Points from 18th to 20th November 2012 at the ACSRT headquarters in Algiers . 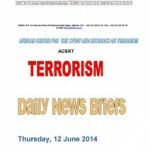 The meeting gathered the ACSRT’s National and Regional Focal Points from 38 African countries, in addition to representatives from the Sahel Fusion and Liaison Unit (UFL), Southern African Development Community (SADC), Committee of Intelligence and Security Services of Africa (CISSA), African Mission in Somalia (AMISOM) and the National Defense College of Nigeria (NDC) . The three day meeting allowed the National and Regional Focal Points (FPs) to be updated on the implementation status of the ACSRT Strategic Plan of Activities 2010-2013 adopted during the 3rd Meeting of the Focal Points, the progress report regarding the operationalization of the ACSRT’s Database and Early Warning System and the tasks accomplished related to the priority areas of the adopted strategic plan of activities. The opening ceremony was graced by H.E. Ambassador Rezag BARA, Adviser to the President of the People’s Democratic Republic of Algeria, H.E Ambassador Ramtane LAMAMRA, Commissioner for Peace and Security of the African Union Commission, Major General Rachid LALLALI, the Director of the Directorate of Documentation and External Security (DDSE) of Algeria and Chairperson of CISSA, H.E Ambassador Francisco Caetano José MADEIRA, AU Commission Chairperson’s Special Representative for Counterterrorism Cooperation and Director of the ACSRT, Mr Isaac A MOYO, Executive Secretary of CISSA, and members of the Diplomatic corps. The official opening ceremony was preceded by the signing of Memoranda of Understanding (MoU) between ACSRT and CISSA and between ACSRT and the Nigeria National Defense College (NDC). 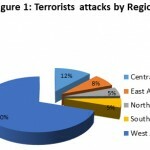 The Focal Points commended the ACSRT and the AUC for the efforts made thus far and welcomed the recent measures taken by the Commission to enhance the effectiveness of Africa’s counterterrorism response, in particular the establishment of the Peace and Security Council (PSC) Counterterrorism Subcommittee, the finalization of an African anti‐terrorism Model Law, in addition to the efforts undertaken to provide technical assistance to Member States and regional Focal Points. 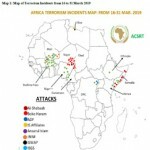 They also acknowledged the need for the ACSRT and the AUC to pursue and intensify their efforts towards building Member States counter-terrorism capacity more specifically the legal and judicial capacities through the populrization of the AU comprehensive Counter Terrorism Model Law and the development of the African Arrest Warrant (AAW) for persons charged with or convicted of any terrorist act, the African List of Terrorist Individuals, Groups and Entities and the strategy to promote the implementation of such tools. Other recommendations that emerged from the meeting were, among others, the need to encourage the ACSRT to pursue dialogue with other stakeholders, continue consultation and coordination with international partners to deliver technical assistance, build capacity and fund the on going national and regional counterterrorism strategies, initiatives, projects and programs. Following the review of the security situation on the continent, participants suggested the need to develop and adopt a convention against narco-terrorism, which should envisage appropriate mechanism to assist member states to combat drug trafficking and organized crime. 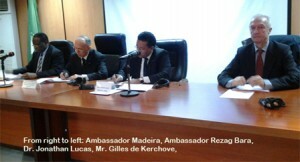 They also suggested that a delegation made up of representatives of the UFL, CISSA and ACSRT, should meet with members of the UN Security Council and the AU Peace and Security Council to brief them on the reality of Narco-terrorism and transnational organized crime and the threat they represent to the continent.